You’ve been with Stone Island for decades but the brand’s modern era (post-Massimo and post-Harvey) started in 2008. What’s been the biggest lesson you’ve learned in that span of nearly a decade? What are some of the trends that you’ve seen come and go? The biggest lesson was not to be afraid to revolutionize the company. We’ve created our house design studio with a young multicultural team that allows us to address the cultural changes from different perspectives, always with fresh eyes and by giving more authority to our product department. This allows us to create product that—even though tenaciously tied to our roots—has been able to anticipate the desires of our consumers and capture new ones. 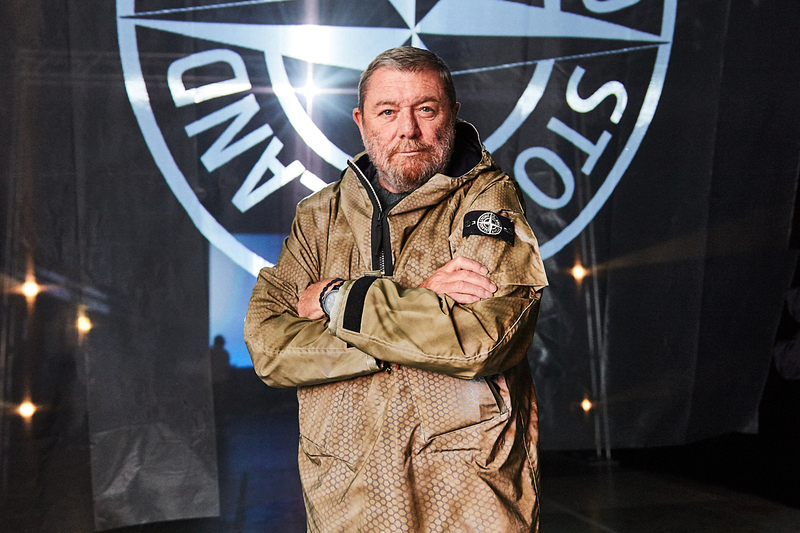 The Stone Island 30th anniversary exhibition in Florence and the Archivio’ - ‘982 ‘012 book in 2012 have been a milestone in this decade—I saw it as the glorification of all the people that worked in the company. You see, Stone Island is a brand but the real heroes are the people working on research, product and production, always aiming to go beyond boundaries. The Stone Island identity is shaped by them. The fashion industry is always evolving. While Stone Island has deep roots as military wear and in soccer, it has recently grown, especially over the last year with the help of Drake and in the streetwear community. What do you think about the current state of the industry and what do you see as the biggest issues facing designers and brands today? What is soccer? We can talk about football—but these are not our roots. The industry now looks like a leopard skin; you do either very well or not well at all. The latter happens when brands talk to a consumer that is not there any longer. I am not just speaking millennials. Old guys like me have also totally changed the way they dress in the last 10 years. Streetwear is a cultural phenomenon that is here to stay. You had an aesthetic revolution starting from the feet, a desperate drive for guys to look cool, a strive to belong, the rise of new medias speaking to transnational and trans-ethnical communities. Looks, art, music, news, in your pocket. The danger is dilution. Too many collaborations. Real stuff will survive and prosper. Stone Island continues to push the boundaries for different ways to apply finishes and creative direction to pieces of clothing. What are some of the techniques and advancements you are working on for 2018 and do you believe the industry will try to emulate you in the future? Emulating products that are already there means being late. Nowadays originals win, not copies. We are a product-oriented company, totally focused on that. We are a peculiar company with unique tools, our processes are often a headache. 2017 has been a strong year for the brand: working alongside Drake, collaborating with Nike, opening your biggest flagship store in Los Angeles, as well as dropping a new collaboration with Supreme. What are some of your biggest highlights for 2017 and how do you choose who to collaborate with? I like to remember Prototype Series 2 with Dyneema. The working title of the prototype drops was ‘Collaborations with Ourselves.’ We wanted to challenge ourselves in non-industrialized fields of research. The LA shop is a joy and a great achievement. Then, collaborations with partners such as Nike and Supreme are a great challenge for us. It is a great opportunity to open yourself to other companies’ minds and processes. We are usually so auto referential, somehow autistic, and we’ve learned a lot. Nike and Supreme came to us—two great companies—and we built a solid relationship. We also collaborated with Porter Japan, another great company. We are not planning to expand collaborations. We don’t need to and have to save energy for our own projects.